PORT AU PRINCE, Haiti, October 28, 1931 - Colonel Thomas C. Turner, United States Marine Corps, died in the field hospital here today of injuries suffered when he was struck on Monday by a whirling airplane propeller. His age was 49. Colonel Turner was brought to Port Au Prince by a naval tug yesterday from Gonaives, Haiti, where the accident occurred. The naval vessel Kittery will leave tomorrow with the body for Hampton Roads, Virginia, where it should arrive on November 5. Colonel Turner was probably the best-known aviation officer of the Marine Corps, having held practically every high command in it. He left here last Thursday morning to deliver a new amphibian plane to Marine Headquarters in Haiti. He is survived by a widow, Mrs. Ether Turner of 1622 Nineteenth Street, N.W., this city, and his mother, Mrs. Mary Turner of Mare Island, California. He was born at Mare Island on March 29, 1882 and entered the Corps as an enlisted man in 1901. In August of the next year he was commissioned a Second Lieutenant. His first duty was in the Philippines. From there he went to Puerto Rico. He was with the First Brigade of Marines in Mexican waters and was among the first officers to land at Vera Cruz when that city was taken by Navy and Marine forces in April 1914, after the rupture between the United States and Victoriano Huerta, the usurping President of Mexico. He was in Vera Cruz for the entire period of American occupation and in 1916 was ordered to take command of the Marines on the battleship Texas. His first land command was the San Diego Marine Base, to which he went from Texas. In 1917 Colonel Turner switched from the land to the air, being detailed by the Secretary of the Navy, Josephus Daniels, for service with the aviation section of the Army, then a part of the Signal Corps. As a junior aviator, he served in Texas and California. It is significant that, although a Marine, he was in command of the Army Air Station at Ellington Field, Houston, Texas. In 1919, he returned to the Marines as an aviator and was assigned to the First Provisional Regiment, which in October of that year, was ordered to Haiti as a result of bandit operations in the island republic. For his services in Haiti, the Haitian Government awarded him its Medal of Honor, praising him as “an officer of remarkable valor,” who had taken an important part in the suppression of the bandits. Other honors conferred on him on various occasions were: Medaille Militaire, 1920-21; Distinguished Flying Cross, 1921; Expeditionary Medal, China, 1912-27-28; Mexican and Haitian campaign badges and Victory Medal. On his return from Haiti in 1920 he was placed in charge of Marine aviation activities in the Navy Department and at the same time designated as Marine Aide to the Secretary of the Navy. While serving in this capacity Colonel Turner made, in 1921, a flight to Santo Domingo and returned to Washington. At that time this was the longest flight ever made by a Marine aviator. On being relieved from duty in the Navy Department, he was ordered to Quantico, Virginia, where until the next year he was commanding officer of the First Marine Aviation Group. A year later he returned to the Army Air Service as a student at the Langley Field Alit Tactical School. After completing the course with honors he was ordered back to Quantico as commander of the Marine Aviation units there. From Quantico he went to China as commander of the Marine Aviation units of the Third Brigade. Returning to the United States, he for a second time was ordered to duty in the Navy Department and put in charge of Marine Aviation. WASHINGTON, November 3, 1931 – The funeral service for Captain Charles Francis Stokes, Medical Corps, United States Navy, Retired, former Surgeon General of the Navy will be held in Arlington National Cemetery at 11 o’clock tomorrow morning with full military honors. Captain Sydney K. Evans, a chaplain in the Navy, will officiate. The honorary pall bears will be: Rear Admiral Frank B. Upham, Chief of the Bureau of Navigation; Rear Admiral C. E. Riggs, Surgeon General of the Navy; Brigadier General George Richards, Marine Corps; Captain Emory S. Land, Construction Corps, U.S.N. ; Captain Arthur W. Dunbar; and Captain Theodore W. Richards. The funeral service for Colonel Thomas Caldwell Turner, Untied States Marine Corps, will be held at Arlington at 2 o’clock on Thursday afternoon with full military honors. Commander William A. Maguire, a chaplain in the Navy will officiate. The honorary pallbearers will be: Representative J. J. Cochrane of Missouri; Rear Admiral William A. Moffett; Brigadier I. T. Myers; Captain W. G. Farrell; Captain D. C. McDougal; Lieutenant Colonel C. B. Sanderson; Lieutenant Colonel Philip H. Terrey; Lieutenant Colonel A. E. Randall; Major E. H. Brainard; Major F. T. Armstrong; Major W. H. Frank; Major Earl C. Long; and Major R. J. Mitchell. 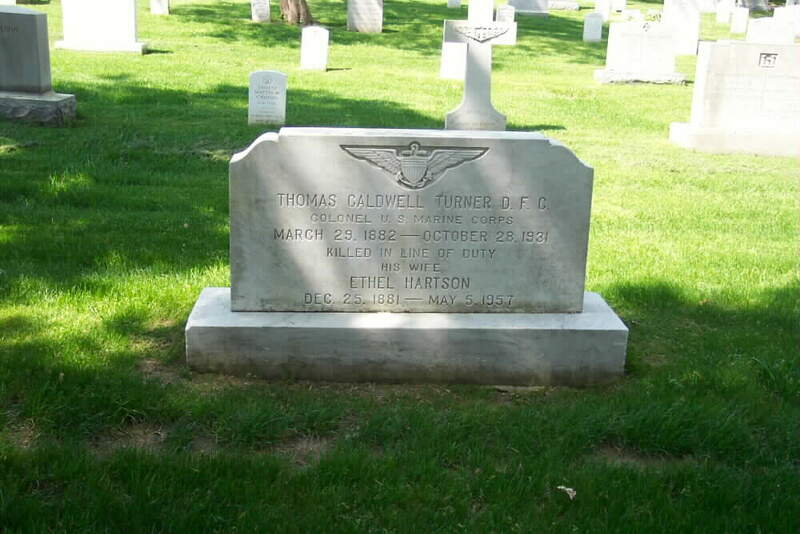 WASHINGTON, May 9, 1957 – Mrs. Ethel Hartson Turner, widow of Colonel Thomas C. Turner, former Chief of Marine Corps Aviation, died Sunday in Bethesda, Maryland, Naval Hospital. Her age was 75. She was active in the Chevy Chase Club and the Washington Club. The airfield at the Quantico, Virginia, Marine Base is named for her husband, who was killed in an airplane accident in 1931. Hiatus due to accidental death of Colonel Turner in Haiti on 28 Oct 1931.
flight over land and water made up to that time.